Transcribed from from a booklet in Widnes library; “The Gravestone Inscriptions of St Lukes Church Farnworth” by A.L. Weir, 1990”. 2. Richard and Ann HOUGHTON. 3. Henry and Alice HOUGHTON. 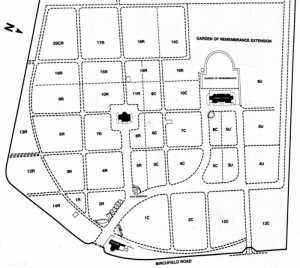 The family plot with my great-grandparents (Samuel and Elizabeth HOUGHTON) is located in section 1C. There are also two urns on the plot; one reads “Our dear son Bill” and the second “Our dear mother”. Below is a table containing inscriptions I have recorded on visits to the cemetery. Comments include information from the cemetery burial records (published by the Liverpool & S W Lancs Family History Society). 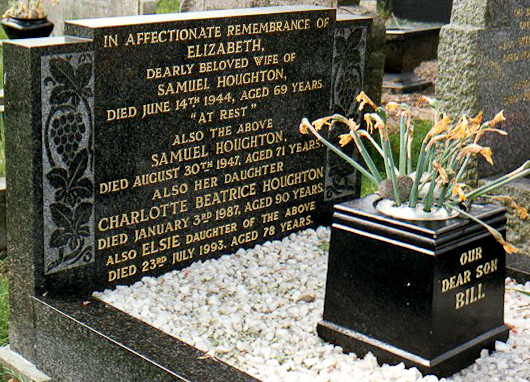 In affectionate remembrance of/ Elizabeth,/ dearly beloved wife of/ Samuel HOUGHTON, died June 14th 1944, aged 69 years/ “at rest”/also the above/ Samuel HOUGHTON,/died August 30th 1947, aged 71 years/also her daughter/ Charlotte Beatrice HOUGHTON/ died January 3rd 1987, aged 90 years/also Elsie daughter of the above/ died 23rd July 1993 aged 78 years. William HOUGHTON 23 9 Mar 1933 In loving memory of William beloved husband of Agnes HOUGHTON/died March 9th 1933 aged 23 years In section 2C (grave # 1429). 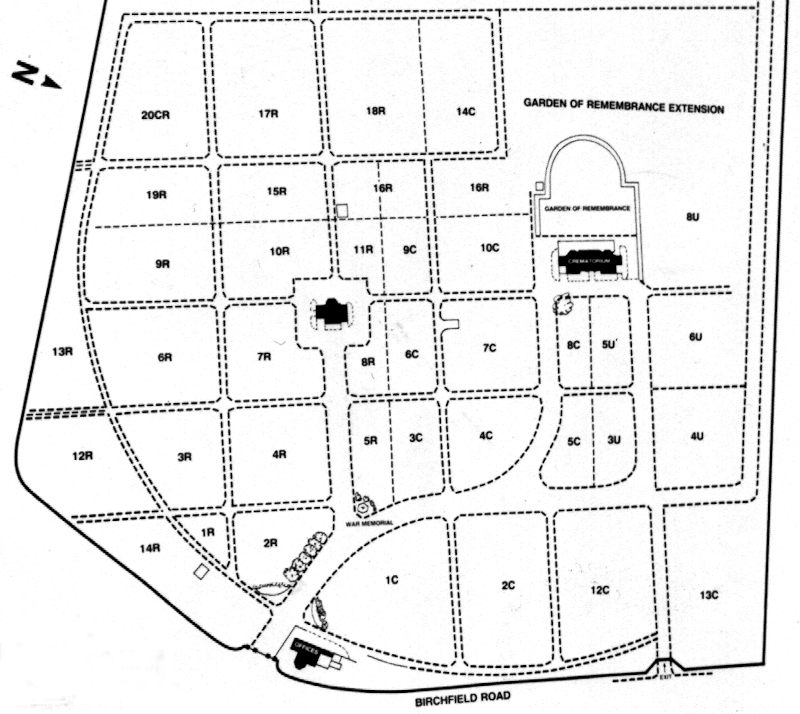 From the cemetery burial records, William was a chemical process worker. He died at and was buried (14 Mar) from 15 Rose St, Widnes. Jane HOUGHTON 73 21 Jan 1933 In loving memory of Jane beloved wife of James HOUGHTON died/January 21st 1933 aged 73 years/also John their beloved son died June 23rd 1935 aged 37 years/also the above James HOUGHTON died January 5th 1940 aged 85 years In section 2C (grave # 1377). From the cemetery burial records, Jane died at and was buried (25 Jan) from 9 Frederick St, Widnes; John died at 1 Warrington Rd, Whiston* (see note below) and was buried (27 Jun) from 24 Princes St, Widnes and James died at 1 Warrington Rd, Whiston* and was buried (8 Jan) from 24 Princes St, Widnes. John HOUGHTON 71 29 Jun 1978 Treasured memories of our Dad and Mum John HOUGHTON died 29th/ June 1978 aged 71 years also Alice May HOUGHTON died 8th October/1980 aged 75 years and Edward Leigh In section 12C (grave # 4897). From the cemetery burial records, John was d.o.a. at Whiston Hospital and was buried (5 Jul) from 119 Leigh Avenue, Widnes and Alice May died at Warrington General Hospital and was buried (14 Oct) from 40 Derwent Rd, Widnes. Ethel May 69 7 Dec 1961 Treasured memories of our dear mother and father Ethel May died/ 7th December 1961 aged 69 years, James died 7th June 1982 aged/ 86 years In section 12C (grave # 4867). From the cemetery burial records, Ethel May died at and was buried (13 Dec) from 57 Greenway Rd, Widnes and James died at and was buried (10 Jun) from the same address. In loving memory of Bob from his devoted wife Jane In section 12C (grave # 4846). From the cemetery burial records, Frances died at the Whiston hospital and was buried (19 May) from 9 Frederick St, Widnes and Robert died at and was buried (19 Sep) from 32 Princes St, Widnes. 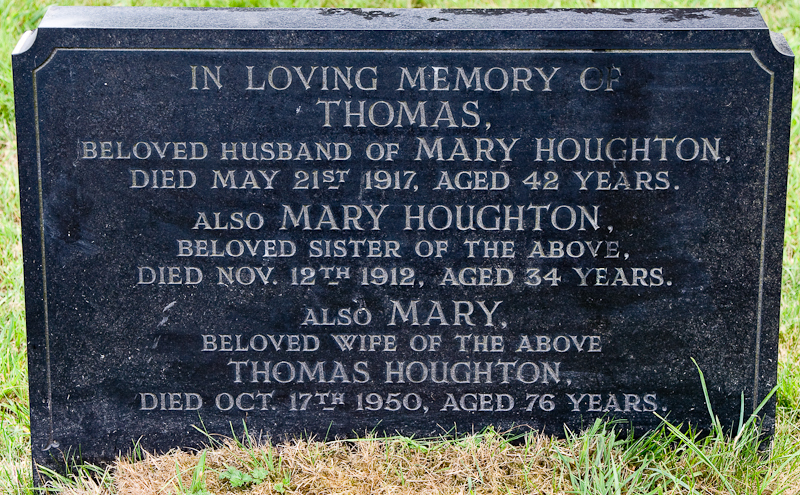 Also listed in the records for the same grave # is Robert Alfred HOUGHTON died 15 May 1983 at Warrington General hospital aged 73, cremated (14 Jun) from 49 Grange Drive, Penketh. Elsie HOUGHTON 1950 HOUGHTON: Elsie 1897-1950 and Jim 1897-1974 In section 12C (grave # 4401). 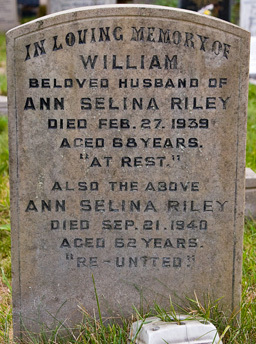 The following cemetery burial record matches the inscription: Elsie died on 13 Jun 1950, aged 52) at the Royal Southern hospital, Fazakerley and was buried (16 Jun) from 42 Sycamore Ave, Widnes. James died on 16 Jan 1974 and was buried (23 Jan) from 42 Sycamore Ave, Widnes. William HOUGHTON 81 16 Dec 1963 In loving memory of William HOUGHTON died 16th December 1963/ aged 81 years also Eliza died 24th August 1968 aged 84 years In section 12C (grave # 4993). The following cemetery burial record matches the inscription: William died on 5 Dec 1963, aged 81 at 16 Beaumont St, Widnes and was buried (16 Jun) from the same address. Eliza HARPER died on 25 Aug 1968 aged 84 at Whiston hospital and was buried (28 Aug) from 16 Beaumont St, Widnes. Francis Samuel HOUGHTON 80 6 Jun 1971 In loving memory of a dear husband and Dad Francis Samuel/ HOUGHTON died 6th June 1971 aged 80 years also Alice his beloved/ wife died 12th May 1975 aged 79 years In section 12C (grave # 4356). From the cemetery burial records, Francis Samuel died at Whiston hospital and was buried (9 Jun) from 2 Browning Ave, Widnes and Alice died at and was buried (16 May) from the same addressAlso listed in the records for the same grave # is Frances Mary HOUGHTON died 28 Jun 1945 at Fall hospital, Horwich aged 18, buried (2 Jul) from 8 George St, Widnes.